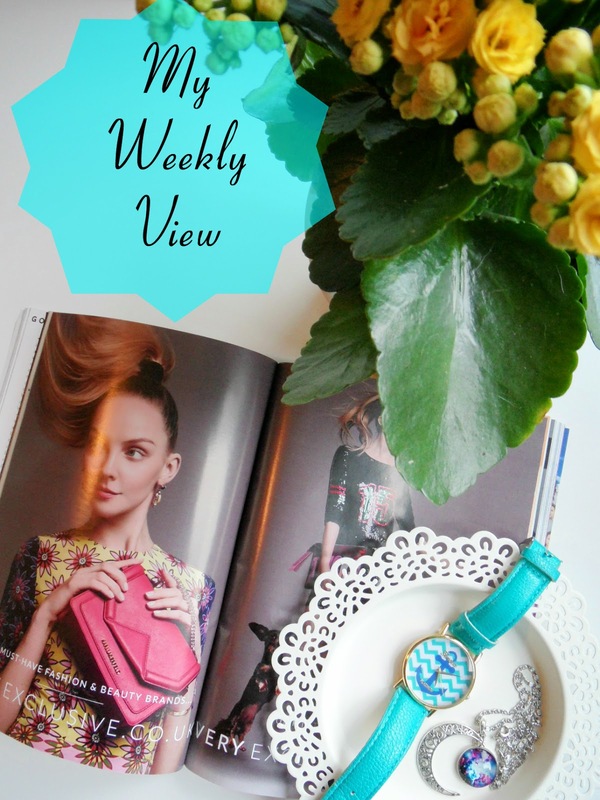 So let's start with week one of "My Weekly View"
1. Tomorrow is my one day off this week. I work 6 days a week, between my full and part time job so I really try to make the most of that one day. Usually by cramming too much in. But tomorrow I'll be popping into town, having my brows done by the lovely ladies in Benefit, (The best brow bar ever, seriously) and treating myself to some shopping - which is rare for me, I don't tend to enjoy shopping usually, I'm more of an online shopping fan but there are a few products I want to go play with and some new Spring scents I'm looking forward to trying before I buy etc. After that I'll probably pop down to visit my mother before spending a relaxing evening with my lovely man. 2. This week I've been going between a few books; Fleur de Force's "The Glam Guide" and "Kerby" a new book written by a friend of mine, Graeme Johnston . Completely different books. Both of which I would highly recommend. 3. I did a sort of supermarket sweep around Primark the other day on my lunch break as I had a few items to return and I finally jumped on the Primark jean craze. I'd watched a good few of my favourite YouTube ladies recommending Primark as having a dupe of the TopShop Joni jeans. Now as a size 18, I really didn't expect to find a pair in my size, never mind a pair that I LOVE the fit of; in Primark of all places. Don't think I can protest my love for these enough. £10 a pair. I'm going back for another four pairs!!! They are super high-waisted and hold in all the bits you want. I can also wear them under my Simply Be Boots without them being too bulky. A new look for me, I know I'm going to be rocking these for MONTHS. 4. I'm still in the winter hibernation stage at the moment. I just want to have dinner and go to bed after work at the moment so this week I've treated myself to some bubble baths, hair masks and topped up my hair dye before having a couple of early nights. I tried a few new products this week; Granny Take A Dip Bath Bomb by Lush, Gold-Linger Bath Creamer by Bomb Cosmetics. Both of these were just soo lovely. I'd recommend both. Although I may be finding gold stars for weeks from the BC one. I also tried out Herbal Essences Dry Shampoo which was quite possibly the worst dry shampoo ever imo and Herbal Essences Bee Strong Intensive Mask which I rather enjoyed. The smell is just lovely. 5. We've decided to start watching the IMDB's top 250 movie list. I know, this is probably something we should have done in the winter months - I'm hoping we can just skip the scary movies but I know Graeme is going to have a different plan. But I'm willing to give the majority of them a go. I think it'll take us a while, especially along with my Netflix and cheesy American Show addiction. 6. I booked a lovely get away with my ladies this week. We're off to Glasgow in June to see Wu Tang Clan (insert something hip here). I managed to get us into a gorgeous hotel with a spa, pool etc so we can "live it up" for a weekend. So excited, I want to go now! I have quite a few things planned for next week so week #2 should be a little more interesting. Or do you have any good recommendations to inject a little life into a tired busy girls life? Or do you have any recommendations of places in Glasgow we could visit on our trip? This is a lovely post idea! I haven't got up to anything that interesting this week, its rolling around to half yearly exam time at school so I feel like I am extremely busy. I do love to have a lush bubble bath during the week to just take a moment for myself and de-stress though.